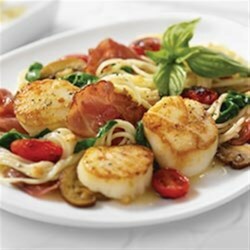 "Crispy Margherita® Prosciutto slices and fresh seared scallops with sauteed garlic, mushrooms, tomatoes and spinach over angel hair pasta in a lemon butter white wine sauce." Cook pasta according to package instructions. Cover to keep warm; set aside. Heat 12-inch saute pan over medium high, add 1 ounce olive oil. Sear scallops for 2 minutes on each side, remove from pan and cover. Add sliced Margherita(R) Prosciutto or julienned Genoa Salami to heated pan, saute for two minutes. Add garlic, tomatoes and mushrooms. Saute for another two minutes. Add wine and lemon juice, cook to reduce by half by deglazing the pan. Add salt and pepper, then stir in butter until melted. Add scallops back into pan and cook until they are heated through. Add fresh spinach and cook until spinach is wilted. Place cooked pasta in the pan. Mix until pasta is well covered in sauce. This was super easy and turned out fantastic! Make sure you dry the scallops before searing. Great dish! I was hesitant to try a recipe with so little reviews, but I am glad I did! It turned out very good. I did substitute white button mushrooms for the crimini and it was fine. This was one of the best new recipe we have tried lately. It was quite easy and very tasty. We added shrimp it was simply delicious. Excellent and easy. Tomatoes could be added later.